Format: ARC. To be published May 2017 in hardcover. Genre: Picture book for older readers? What did you like about the book? 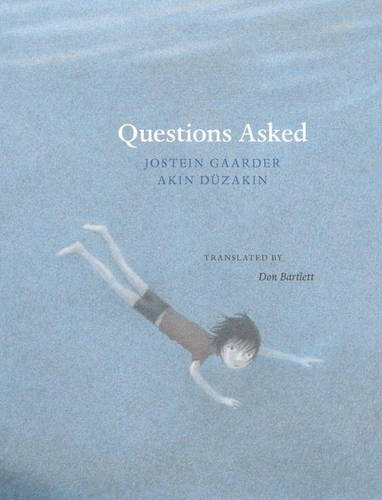 This book has parallel stories: one consisting of philosophical questions about existence, meaning and memory; the other a story told in pictures of a little boy and his missing friend (or twin). Melancholy and existential, the questions relate to what the boy may be thinking, while the ethereal illustrations show his past and his current grief. There is a dog, shown in the past as a puppy, which grounds the story in reality. The questions may not have answers, but are related to the pictures in a way which invites many interpretations. The palette is of dreamy blue, gray and sepia, which echoes the melancholy of the deep questions being asked. A lovely and probing book for older readers unafraid to ponder deep questions of philosophy. It also could be viewed as a meditation on grief and recovery. To whom would you recommend this book? The ethereal nature of the illustrations reminds me of Berger’s Grandfather Twilight, while the quiet text is almost existential. This is for ages 8 and up. This entry was posted in *Starred Review, Book Review and tagged Elsewhere Editions. Bookmark the permalink.